Frozen out last week, Penicuik Athletic hope to be back in action this Saturday when they host Coldstream in the fourth round of the South Region Challenge Cup. No extra incentive will be needed knowing a potential clash against Lowland League leaders East Kilbride awaits in the quarter-finals should they emerge victorious this weekend. Cuikie won the early-season encounter 4-2 against Coldstream in late August. Last week a frozen pitch denied Penicuik the chance to secure a semi-final place in the Football Nation Qualifying Cup after their tie with University of Stirling was postponed. The winners will face Spartans in the last four after they beat Tranent 3-2. It’s been a turbulent week for Newtongrange Star after the shock departure of manager Stevie McLeish, who had spent two and a half years in charge at New Victoria Park. 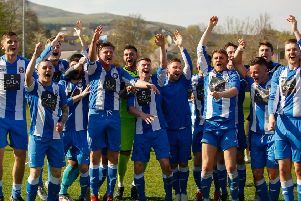 A 3-0 win over Dunbar helped to somewhat ease their frustrations as they completed a league double over the Seasiders to remain in fourth in Conference A.
Newtongrange continue with league business this Saturday hosting Hawick Royal Albert, whom Star hammered 9-1 in August. Next Saturday Nitten are away to Hill o’ Beath in the league before their EGM to discuss the future of the club on February 5. Arniston Rangers won an eight-goal thriller away at Tweedmouth Rangers last Saturday with Laurie Jones netting four times, and they will be looking to exact revenge on Leith this weekend after a 3-0 defeat in August. Bonnyrigg Rose return to action after their postponement last week against Jeanfield Swifts when they face Sauchie away in Conference B hoping to continue their remarkable unbeaten league record. The Rose beat Sauchie 5-0 at New Dundas Park in December and will hope to chalk up their 15th win in 16 league games. Oakley United whom the Lily beat 2-1 at Easthouses in August. Dalkeith Thistle will hope to bounce back from their defeat to Tynecastle when they face Edinburgh United. Oakley United v Easthouses Lily (ko 2.30 p.m.) Conference B: Dundonald v Haddington Athletic. Sauchie v Bonnyrigg Rose (ko 2 p.m.), Tranent v Boness (ko 2 p.m.), Dunipace v Eyemouth.